Here is our sweet Disney Christmas Minnie Mouse with a Santa Hat and Bow. 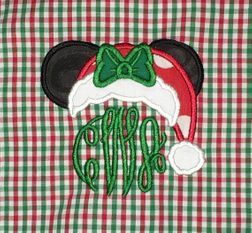 The Minnie Mouse Santa Hat with bow is a monogram topper! Your little one's initials form Minnie's head. The initials are done in a green to match the green in the Christmas gingham dress. 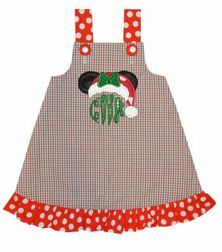 We take the pretty Christmas green, red and white gingham and make a square neck dress or swing top with red with white dots shoulder straps and a red with white dots fabric ruffle. The shoulder straps fasten with covered buttons made with the red with white dots fabric. 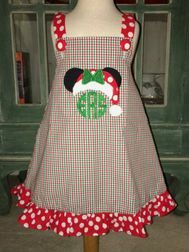 The front has the Minnie Christmas Santa applique/monogram. If you choose the 2 piece outfit, the shorts/capris are also made with the same gingham and have the same dotted ruffle. You may choose between the Circle Block or Fancy Script monograms.